As people live longer, it is vital that we take advantage of advances in care home technology to continually enhance the quality of care we provide, as well as further enrich our residents’ lives. The technology that is transforming the way we are working in Sanctuary Care homes is undoubtedly kradle – Sanctuary Care’s bespoke electronic care planning app. 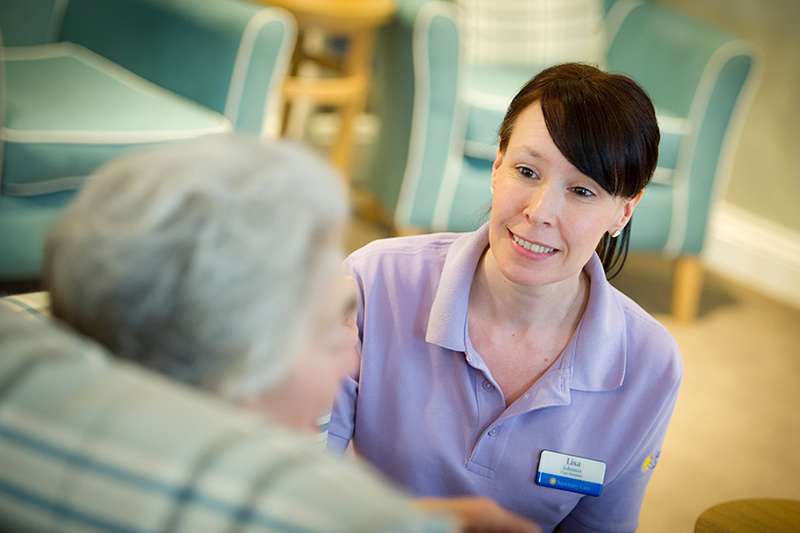 In partnership with Sanctuary Group’s IT team, a group of dedicated staff with a wealth of experience of caring for our residents worked together on the design and development of kradle, which is now being rolled out across all of our care homes. 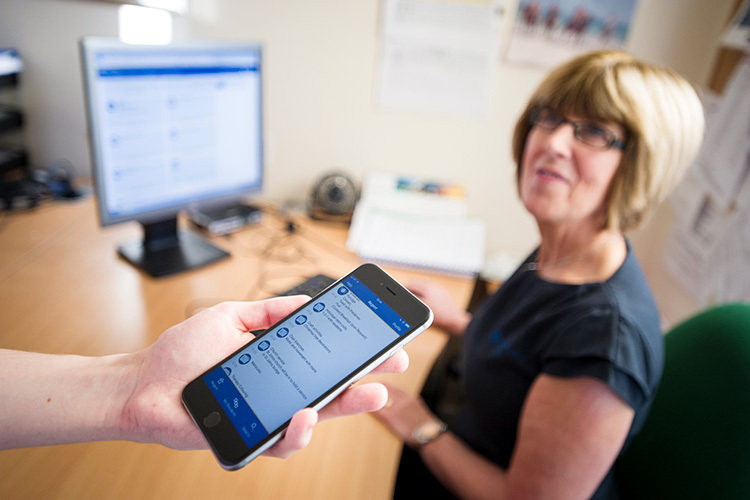 Instead of Sanctuary Care staff spending lengthy amounts of time constantly updating paper copies of residents’ individual care plans, they are able to record vital details at the point of care on an iPhone, meaning they have even more quality time to spend with their residents. The benefits of kradle for both our residents and staff are endless. Whether we are recording details about a person’s medical records or a resident simply wants to know what activities we have planned or what is for lunch that day – everything is available at the touch of a button, giving everyone additional peace of mind. Read more about our care planning app on the kradle case study page. Sanctuary Care is also passionate about exploring the use of other forms of technology in care homes. We are excited to be looking at the benefits of acoustic monitoring in one of our homes later this year. This innovative care home technology unobtrusively monitors the sound in residents’ bedrooms, reducing the need for care staff to potentially interrupt a person’s sleep by checking on them throughout the night. We also embrace other forms of technology to help keep residents safe, including assistive technology such as pendants. Some tech-savvy residents welcome Skype and forms of social media such as Facebook and Twitter to help keep them connected with friends and loved ones. 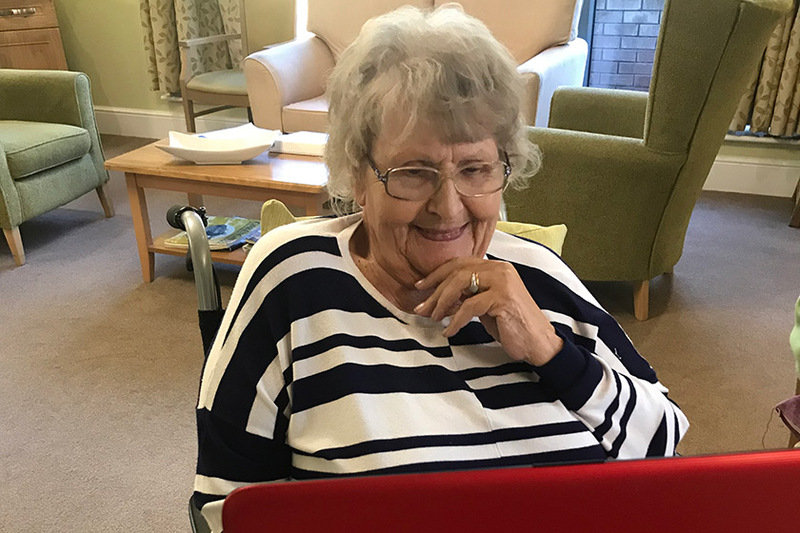 Sanctuary Care homes have Wi-Fi and our staff are only too happy to help residents if they need a hand getting to grips with new technology, it’s great seeing our social seniors become more digitally independent. For Sanctuary Care paper care plans are old-hat. We have created an in-house app called ‘kradle’ in partnership with Sanctuary Group’s IT team which ensures we continue to provide the very best care for our residents. Sanctuary Care’s bespoke system of electronic care plans, known as kradle, is an assistive technology programme that was developed by and for our staff, but what do our staff really think? 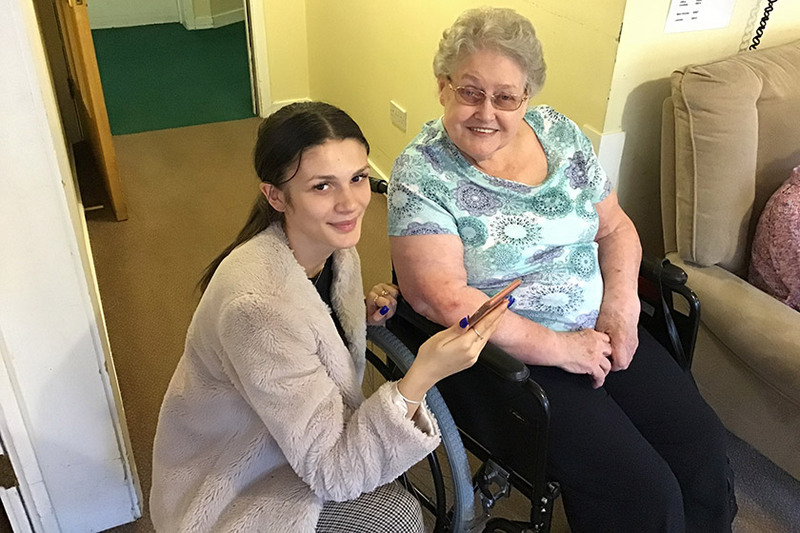 Students have been teaching residents at Brambles Residential Care Home in Redditch how to be confident elderly internet users with an intergenerational activity session that taught them the basics of using mobile phones, the internet and social media. 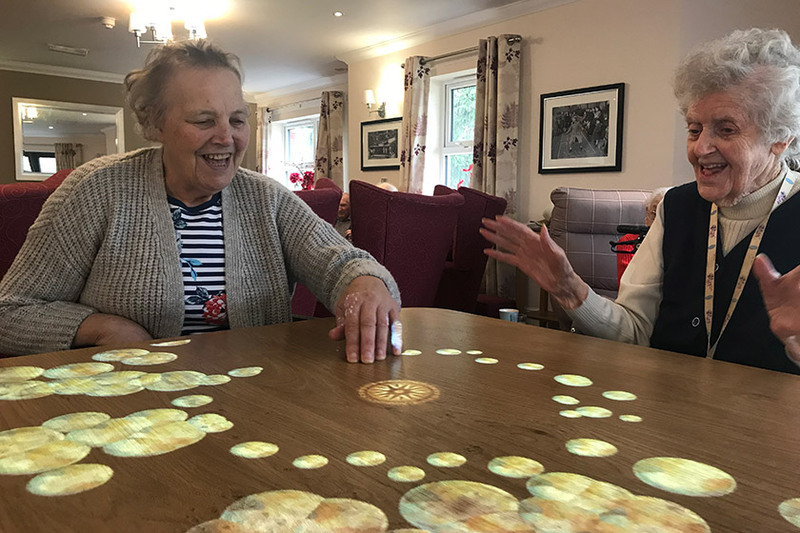 Sanctuary Care residents are benefiting from innovative technology in the form of light games for people with dementia. It is not just the younger generation who are immersed in the digital revolution and social media. As part of our technology in care homes month, we celebrate the rise of our social seniors and the ‘tech-savvy’ residents living in our care homes. Sanctuary Care are always looking for innovative ways to enrich the lives of our residents and better support our staff; its latest investment will be in trialling acoustic monitoring.